Participants at a TEA party in Bettendorf. 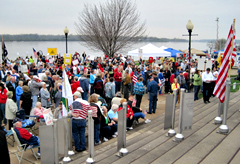 A TEA party drew a big crowd in eastern Iowa Tuesday. They waved flags, held up signs and sang. The TEA Party Express brought its brew of discontent to Bettendorf yesterday. TEA stands for Taxed Enough Already. But a couple hundred people who rallied for two hours alongside the Mighty Mississippi had more than excessive taxation on their minds. Protesters spoke out against a variety of government policies, including bailouts and the new health-care legislation. They say it’s not about Republicans or Democrats but about saving the country. They promise to take their concerns to the ballot box in November.